Now avariable at: www.LastSword.comElven Lords are 32mm miniatures, sculpted and crafted in Spain for 9th age and others fantasy wargames. 115 backers pledged €8,227 to help bring this project to life. Puedes verlo en castellano aquí nuestra traducción al castellano. The Elven Lords is our second Kickstarter after the success of Reichguard Knights. All desing, sculpture and molding work is already completed. We are now ready to take your orders and start manufacturing. But, if the project is all but finished, what is the funding for? Our aim is to be able to further develop our range of miniatures. We have made a great many efforts and spent a lot of money on The Elven Lords, so we really need the project to succeed. The Kneecap system of our miniatures allows us to position them in multiple ways. In addition, with the use of independent shoulder pads, the joints between the pieces are completely covered. 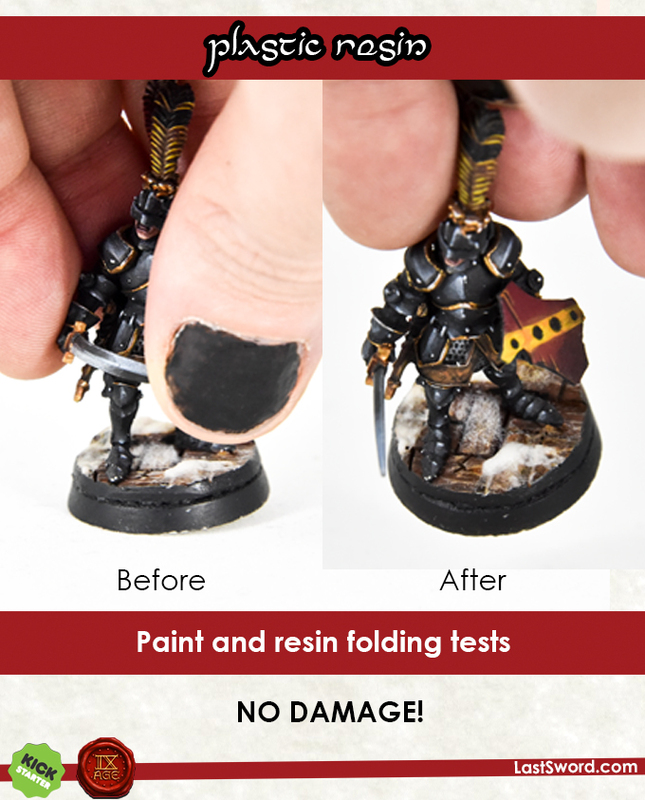 Our plastic resin is flexible enough to prevent miniatures from being damaged by bending, hitting or accidentally dropping them. It is also very easy to glue it with cyanocrylate. All you need is a sharp modeling blade to remove the mold lines. When you have hundreds of ideas banging in your head, it is always best to draw a sketch. This is the first step to every project. Sculping the miniature with green putty or in 3D is the second step. Finally, all that remains is to make the miniature... it seems so simple, when you say that. This whole process takes a lot of time and it is normal for the final design to deviate slightly from the previous steps. Furthemore, the Elven Lords' miniatures have no problem fitting into ranks and regiments. They will fit perfectly, even at an angle or medium angle. 3d sculpting allows to us design multipose figures easily than hand sculpt techique. Our bits are interchangeable, so you can use archers bodies, with spearmen arms, or heads. Besides, Elven Lords haven't any problem while you are basing a regiment. Our figures fit really good in ranks without any problem. Even you can pose them straight or half turned. Our figures are 32mm models, from the feet to the eyes. Are they compatible with others companies models? Just have a look to our scale test, and decide by your self if Elven Lords are compatible or not. Besides you can mix all pieces among them. Would you like to make a light spearman or a heavy archer? You can do it! The elves is a powelful race. But it was not always in this way, elven race has grown like a tree from the ground to the sky. Elf Prince is a 32mm multi-part metal figure. "Now, we don't have to look up to see the stars". Elf mage is a 32mm multi-part metal figure. Elven spearmen are multi-part and multi-pose miniatures of plastic resin in 32mm. Thanks to the kneecap system you can assemble them in the pose of your choice and hide the joints with the shoulder pads. Elven archers are multi-part and multi-pose miniatures of plastic resin in 32mm. Thanks to the kneecap system you can assemble them in the pose of your choice and hide the joints with the shoulder pads. Note: The fourth archerhas been assembled with components of the 2nd Command Group Sprue. "Our banners are like the light of the stars, they herald our arrival". Special components sprue: Drako banner, dragon horn, metal Cornus, two heads and a sword. You can use them as a command group for spearmen or archers. Special component sprue with: Tree banner, hunting horn, two heads, three swords and a bow . You can use it as a command group for spearmen or archers. New Addons. Three packs with sculptured shields and swords. We would like to thank all the support and trust show by our backers. So every time one of the stretch goals is met, we will unlock free* stuff. You can also add more of these Stretch Goals to your order as if the were addons before unlocking. *See contidions in each stretch goal. Unlock this Stretch Goal for a free Elf Prince with your Regiment and Cohort, or with orders over 54€. Get one free 1rst Comman Sprue free for every 20 Elven Lords infantry miniatures. Unlocking this Stretch Goal you will be able to add the 1rst Command Sprue. Unloking this Stretch Goal you will be able to add for free the 2nd Command Sprue instead of the 1rst Command Sprue. Unlock this Stretch Goal to get free Elf Mage with your Regiment or on orders over 79€. An extra bare head and hand with magic ball. Elf Prince miniature not included. Unlock this Stretch Goal to get these components for free with all orders containing and Elf Prince (even if you got it for free!). Choose your Add-ons! Once the kickstarter campaign is finished, backers will get access to the Pledge Manager website, where you will be able to place and order, adding as many add-ons as you want. We have been sculpting and painting new scenery pieces since our first Kickstarter. Our new products are the forest, The barrels, The pedestals and The fountain! All we need to create our unique scenery is a little bit of Super Sculpey or green putty and some modeling tools. We model and manyfacture our own scenery using polyurethane resin. Now we have extra scenery pieces! Remember that our scenery is designed to be use on 28-32mm wargames. We want to offer you high quality, but occasionally there may be some bubbles. Don't worry, if you are not satisfied with our product, we will replace it. Big ruined house blog entry. "The old knights are back. Wearing full plate armor, and brandishing their weapons, the Reichguard Knights are messengers of death to their enemies. The Reichguard knights are not only the High King's shield, but also the strong arm of the King of Kings. The king's will is expressed throught his knight's voices". Foot Knights are multi-part and multi-pose miniatures of plastic resin in 32mm, as The Elven Lords infantry, armed with teither great swords or sword and shields. The Command Group, Reichsmarshall & Squire, and the Arch Elector Bishop are mono-pose miniatures in metal. Reichguard foots knights blog entry. Arch Elector Bishop blog entry. Our cobblestone bases have been sculpted by hand, and we offer them in a wide range of sizes. Made of polyurethane resin. We really appreciate your support, thank you very much! If you want to support our project, just select one of the Pledges. If you would like a pledge and some addons, all you have to do is select your pledge and t hen add the amount for the add-ons by appending it to "Addons & extra pledges". Would you like more than one pledge? Just, select the main pledge and then add the sum of the others pledges to "Adddons & entra pledges". In addition, if you are not an elven player, you also can select only add-ons. Sum up the total value of the Add-ons you want and add them as "Addons & extra pledges"
After kickstarter campaign ends, you will recieve an email with your user account details toplace the order on our Pledge Manager website. You can increase your contribution and purchase more items if you wish. You can also view the shipping charges for your order. Of course! We keep working and we will include new add-ons before the Kickstarter campaign ends. The shipping cost for your order are set one you place your order in the Pledge Manager website. The shipping cost is bases on the weight of the order. All shipments will have a tracking number. In addition, we are also offer the option of picking up orders in person during Hispania Wargames 2018 at Alhaurin de la torre, Malaga, Spain. This is not tge first Elven Lords kickstarter campaign. The first one took place in September and we have to cancel it because it was not working our well. The success of this project is very important to us. We have invested all our money in these miniatures and we can not afford to keep developing new ones if we do not reach our goals in this campaign. What if the campaign is a success? 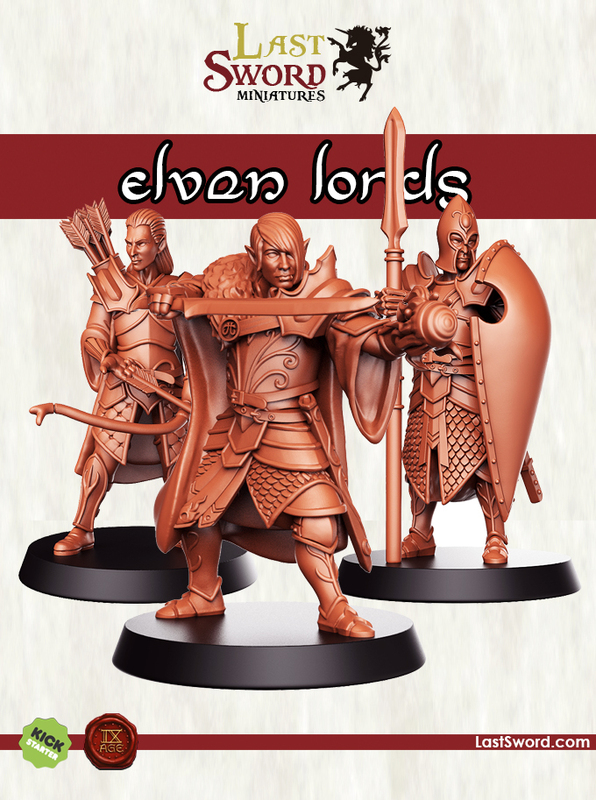 This kickstarter is the first step for Elven Lords range. We would like to develope a full Elven army. Our next project would be Dragon guards with two-handed swords (Sword Masters) or great axe (Lion Guards). We have already started worlkng on the concepts. So we can show you what out figures would look like. The team at LastSword Miniatures is not very large, but we are as excited as th first day, although with a few more battle scars. James and Lily Potter, for their sacrifices! To all the backers of our first kickstarter. To Pedro and all the guys from GT Studio for their help in our darkest times. Before our first succes kickstarter, the risk is minimal! Our figures have already been sculpted. The master moulds are already done too. If this project is founded, we can immediately initiate creation of the production moulds, so that we will be able to commence the initial production after completion of the Kickstarter. We expect the first miniatures to be delivered six to eight weeks following completion of the campaign. This means that you may already receive your figures as early as january 2018 at the latest. Take an elf Prince or an elf Mage. Pick up any of the infantry packs up to 3. Example: 4 Spearmen and 8 archers. Pick up any of the infantry packs up to 5. This pledge can have stretch goals rewards. Example: 12 spearmen, 8 archers. Pick up any of the infantry packs up to 5 and two extra models. Example: 12 spearmen, 8 archers, a 1rst Command squad sprue and 2 spearmen. Pick up any of the infantry packs up to10. Example: 32 spearmen, 8 archers, a 1rst Command squad sprue and a 2nd Command squad sprue. Pick up any of the infantry packs up to 10 and an extra pack. Example: 28 spearmen, 12 archers, a 1rst Command squad sprue, a 2nd Command squad sprue and 4 archers. Pick up any of the infantry packs up to 20. Example: 68 spearmen, 12 archers, a 1rst Command squad sprue and a 2nd Command squad sprue. Pick up any of the infantry packs up to 20 and two extra packs. Example: 80 spearmen, 0 archers, a 1rst Command squad sprue, a 2nd Command squad sprue and 8 archers.